All Replies on Quick N Easy Circle Jig for Router. 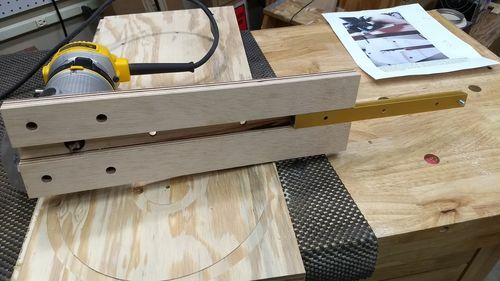 Quick N Easy Circle Jig for Router. DDWW, that jig couldn’t be any simpler,thanks for posting the pics. 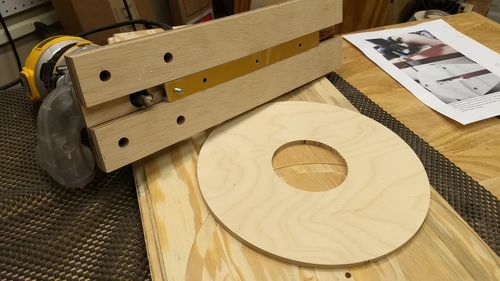 Thanks for this, I’ve been trying to figure out how to cut a circle with a smaller diameter than my router base. Nice jig, thanks for posting. Thanks for this, I ve been trying to figure out how to cut a circle with a smaller diameter than my router base. 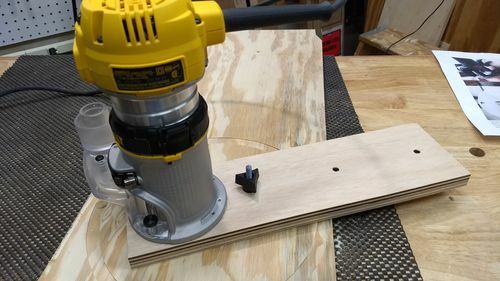 Thanks I had the same need and figured I’d finally make a simple jig instead of just using a piece of quarter inch ply to make single use Jig. Be sure to get some double sided tape to fasten your stock down particularly the middle circle. It has to stay put as you finish cutting or your going to go off track and gouge the sides. It is pretty simple and I was able to get it right down to the 3 and 7/8” I needed for my dust hose connector. 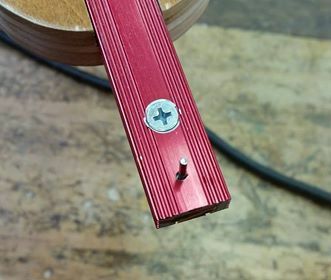 I like your jig a lot, I need one of these for holes in my cajon backs, now that I have worn out my 4” hole saw. Did you tap the hole for the pivot screw? Its not clear what holds it tight. Yes I threaded it in. You could also use a dab of epoxy. I like to unthread that screw and have the option to use a larger 1/4 threaded hole on the other end. It gives a bit more stability. Make sure ther is a larger hole then the bit size to allow for taking out the dust. Mine was zero clearance and dust had nowhere to go. I’d route part way remove vaccum and reinsert the jig. Also key is using double sided tape or pins to fasten the outside and inside circle to a sacrificial board underneath. 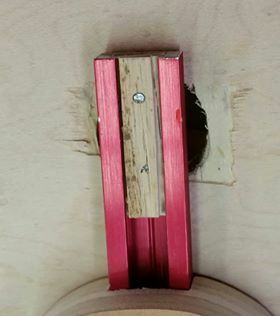 If not at the end of your cut if the inside or outside move it screws up your cut. I’ll have to take a look at your cajons. DDWW, thanks for your post. My jig modeled after yours worked out well. I tried it out on a reinforcing ring for my DustDeputy lid, which I have been wanting to add for some time. The pivot pin here is set for 3”, the lid lnlet diameter. Although the OD of my ring came out perfect, the inner hole cutout ended up with one little dimple at the starting point. I haven’t figured that out, the workpiece was quite firmly taped to the backing board. I will need to do more trials before cutting a real cajon back. Thanks again. I built mine to try mount a cheap import cyclone. I had a similar issue w the small hole. My blank shifted as the cut completed and gave me a little dimple. I think on the smaller holes it may put more pressure on the center screw. It might help if you used a longer pivot screw and went through the sub straight your cutting on. I”d use the jig to make the perfect template and then use a pattern bit to cut the holes in any important piece of work. Thank you for the inspiration and pics, I made mine and changed the pin configuration to this. I hope you don’t mind me adding them here? Thank you for the inspiration and pics, I made mine and changed the pin configuration to this. I hope you don t mind me adding them here?! Looks good I think your pin configuration is probably more stable. I’m glad you found it helpful, I like simple jigs that get me back to making sawdust.